This point established, it becomes apparent that the rusting of iron is primarily due, not to attack by oxygen, but by hydrogen ions. Absolute confirmation of this view will be given later on. In order that rust should be formed iron must go into solution and hydrogen must be given off in the presence of oxygen or certain oxidizing agents. This presumes electrolytic action, as every iron ion that appears at a certain spot demands the disappearance of a hydrogen ion at another, with a consequent formation of gaseous hydrogen. The gaseous hydrogen is rarely visible in the process of rusting, owing to the rather high solubility and great diffusive power of this element. Substances which increase the concentration of hydrogen ions, such as acids and acid salts, stimulate corrosion, while substances which increase the concentration of hydroxyl ions inhibit it. Chromic acid and its salts inhibit corrosion by producing a polarizing or dampening effect which prevents the solution of iron and the separation of hydrogen. This will he more fully discussed later on. From the standpoint of the electrolytic theory, the explanation of the corrosion of iron is not complicated, and so far has been found in accordance with all the facts. Briefly stated, the explanation is as follows: Iron has a certain solution tension, even when the iron is chemically pure and the solvent pure water. The solution tension is modified by impurities or additional substances contained in the metal and in the solvent. The effect of the slightest segregation in the metal, or even unequal stresses and strains in the surface, will throw the surface out of equilibrium, and the solution tension will be greater at some points than at others. The points or nodes of maximum solution pressure will be electro-positive to those of minimum pressure, and a current will flow, provided the surface points are in contact, through a conducting film. If the film is water, or is in any way moist, the higher its conductivity the faster iron will pass into solution in the electro-positive areas, and the faster corrosion proceeds. Positive hydrogen ions migrate to the negative areas, negative hydroxyls to the positives. As explained in a previous chapter, by a hydrogen ion is meant a dissociated hydrogen atom carrying its equivalent static electrical charge, which may be represented by the symbol H+. The hydroxyl ion is written OH-. Water, which may be expressed by the symbol HOH, is made up of the dissociation products H and OH. An acid like hydrochloric acid (HCl) dissociates into H+ and Cl-. An acid is always highly dissociated in solution, while water itself is only slightly dissociated. This explains why the presence of an acid increases the concentration of the hydrogen ions. Ionization always takes place in every solution of an inorganic compound, and even the purest water is slightly dissociated into its constituent ions H+ and OH-. The more ionized a solution is, the higher its electrical conductivity, and the more rapid the damage to the underlying iron. If the concentration of the hydrogen ions is sufficiently high, which, as has been shown, is only the same as saying if the solution is sufficiently acid, the hydrogen ions will exchange their electrostatic charges with the iron atoms sweeping into solution, and gaseous hydrogen is seen escaping from the system. This takes place whenever iron is dissolved in an acid. 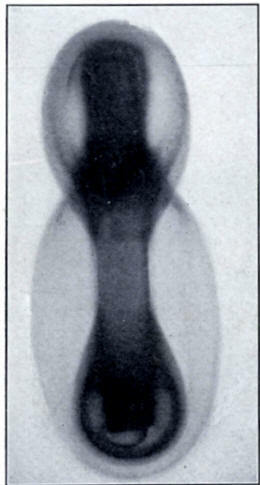 If, however, as is usual in ordinary rusting, the acidity is not high enough to produce this result, the hydrogen ions will polarize to a great extent around the positive nodes without accomplishing a complete exchange, and the so-called electrical double layer of Helmholtz will be formed. This polarization effect resists and slows down the action. 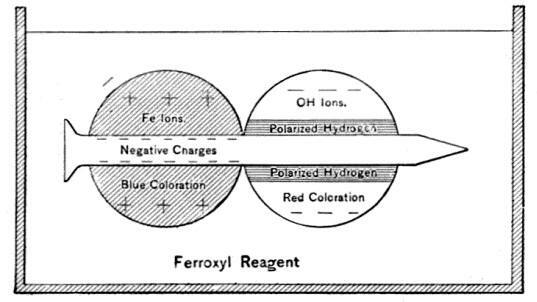 Nevertheless, although it cannot be seen, some exchange takes place and iron slowly pushes through, as is shown by the development of the blue nodes in the ferroxyl test. For every exchange of static charge between iron and hydrogen at the positive node, a corresponding negative hydroxyl ion appears at the negative node which is shown in pink with the ferroxyl indicator. In other words, as fast as the iron sweeps into solution the concentration of ferrous hydroxide grows, but the ferrous reaction appears in one place and the hydroxyl in another. It is now that the oxygen of the atmosphere dissolved in the solution takes up its work, the ferrous ions are oxidized to the insoluble ferric condition, which results in the precipitation of rust, and the action of hydrolysis proceeds. The formation of the insoluble ferroso-ferric carbonates and hydroxides, changing to the red ferric hydroxide known as rust, is familiar to every one. Every metal when placed in water, or under such conditions that a film of water may condense upon it, tends to dissolve in the water, or, in other words, to pass from its atomic or metallic condition into its ionic condition. This escaping tendency of the metals varies from that shown by sodium or potassium, which is so great as to cause instant and rapid decomposition of the metal and water, to gold or platinum where such tendency to dissolve is zero. Between these two extremes we find the other common metals, including there under the element hydrogen, which may be considered as a metal. As the atom of metal passes into the water, it assumes a positive charge of electricity, leaving the metallic mass from which it separated charged negatively; this property or escaping tendency of the metal is termed its solution pressure. It is obvious, however, that this action can continue for only a short time; owing to the fact that the mass of metal and solution are of opposite polarity, the electrolytic tension becomes so great that no more atoms can escape to the ionic state, and the solvent action ceases. This condition was first described by Helmholtz, and called by him an electrolytic double layer. If now there be in the water ions of another metal which has a smaller solution pressure than the one under consideration, the action as above described will be reversed and the ion with the less solution pressure will pass back to the metallic state, plating out on the first metal and giving up its charge of electricity. At this point the first metal will be charged positively, and the solution in the immediate vicinity negative, and there will tend to be set up a second electrolytic double layer opposite in polarity to the first. The result is, a current of electricity flows from the metal to the solution at the point where the metal passes into solution, through the solution to the metal at the point where the ions of the second metal are plating out, and back through the first metal to the starting-point again. The electrolytic double layers are thus destroyed, an electric current passes, and the solvent action of the water on the first metal continues. "This phenomenon and its relation to the corrosion of iron are clearly exemplified in the well-known Daniel or gravity cell. In the case of pure iron in water a perfectly analogous condition is found to exist. Water itself is dissociated to a small but perfectly definite extent into its ions, hydrogen (H) and hydroxyl (OH). When a strip of pure iron comes into contact with water, it sends into the water iron atoms in the form of positively charged ions. Hydrogen as a metal has a much smaller solution pressure than iron, and hence an equivalent number of hydrogen ions plate out on the iron strip (leaving the free hydroxyl ions with their negative charges to balance the iron ions with their positive charges), and an electric current flows from the iron by means of the iron ions to the solution, and by means of the hydrogens from the solution back to the iron again, thus completing the circuit. But here comes an important break in the analogy of the film of copper in the Daniel cell. Deposited copper is a good conductor of the current, and offers no resistance to its flow from the solution to the iron on which it is attached. The reverse is true of the deposited hydrogen; here we have a high insulator - a film of gas which offers a great resistance to the flow of the current. Hence, although in the case of the iron strip in water all the conditions for continuous solution are present, owing to the resistance offered by the deposited hydrogen film (called polarization) the action must cease. "Just as in the case of iron in a copper sulphate solution, the rapidity of the action depended upon the number of copper ions present in the solution, so here the solution of the iron, in the first instance, depends upon the number of the hydrogen ions present. This number of hydrogen ions, or the concentration of these ions, is increased by the addition of any acid. So weak an acid as carbonic increases the number, but to a relatively small amount; while a strong acid, like hydrochloric or sulphuric, adds to the number to such an extent that the solvent action becomes violent, and the deposited hydrogen comes off as a stream of gas. "Since the presence of the polarizing film of hydrogen arrests the further solution of the iron, it is obvious that in order for the reaction to. proceed this hydrogen must be removed. The destruction of the hydrogen film in ordinary corrosion is accomplished by the oxygen of the atmosphere, which is dissolved in the water. The action here taking place is a simple union of the hydrogen on the iron and the oxygen dissolved from the air, with the re-formation of water. It follows from this that any substance which dissolves or reacts with hydrogen should accelerate corrosion. This is found to be in fact the case." It is a matter of common observation that iron usually corrodes rapidly at certain weak points, the effect produced being known as pitting. That this effect can best be explained by the electrolytic theory there can be no doubt, and it was in the effort to obtain an actual demonstration that the now well-known "ferroxyl" reagent was evolved. Early in his investigations one of the authors observed - that whenever a specimen of iron or steel is immersed in water or a dilute neutral solution of an electrolyte to which a sufficient quantity of phenolphthalein indicator has been added, a pink color is developed. If the solution is allowed to stand perfectly quiet, it will be noticed that the pink color is confined to certain spots or nodes on the surface. The pink color of the indicator is a proof of the presence of hydroxyl ions, and thus indicates the negative poles. It may be added that some specimens of steel exhibit this phenomenon much more quickly and distinctly than others. Since phenolphthalein shows only the nodes where solution of iron and subsequent oxidation does not take place, Walker suggested the addition of a trace of potassium ferricyanide to the reacting solution, in order to furnish an indicator for the ferrous ions whose appearance marks the positive poles. If iron goes into solution, ferrous ions must appear, which, with ferricyanide, form the well-known Turnbull's blue compound. Walker further showed that if the reagent is stiffened with gelatin or agar-agar, diffusion is prevented and the effects produced are preserved. For this combined reagent, which indicates at one and the same time the appearance of hydroxyl and ferrous ions at opposite poles, one of the authors has suggested for the sake of brevity the name "ferroxyl." If the reagent has been properly prepared, the color effects are strong and beautiful. In the course of a few days the maximum degree of beauty in the colors is obtained, after which a gradual deterioration sets in, although the effects can be preserved for a long time by flooding the jelly with alcohol. In the pink zones, as would naturally be expected, the iron remains quite bright as long as the pink color persists. In the blue zones the iron passes into solution and continually oxidizes, with a resulting formation of rust. Even the purest iron develops the nodes in the ferroxyl indicator, but impure and badly segregated metal develops the colors with greater rapidity and with bolder outlines. 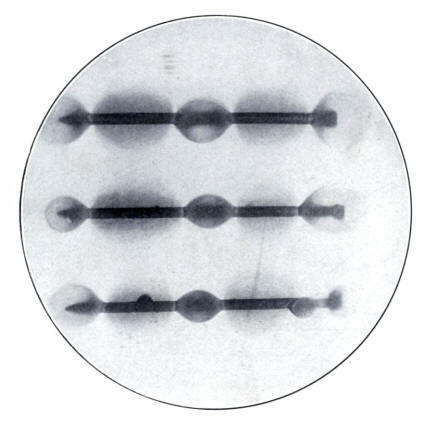 This result would of course be expected, as in pure iron the formation of poles would be conditioned by a much more delicate equilibrium than in impure iron, where variations in concentration of the dissolved impurities would stimulate the electrolytic effects. Even so-called chemically pure iron contains small quantities of dissolved gases, and it is not improbable that even slight variations in the physical homogeneity of pure iron will occasion the electrolytic effects which are made visible by this delicate reagent. It should be remembered that the electrolytic action indicated by the ferroxyl tests is conditioned by a very delicate equilibrium. In order to decompose water by the electric current a very much higher difference of potential is needed than ever exists between points on the surface of a piece of corroding iron or steel, however badly segregated it may be. The entire value of the ferroxyl test consists in the fact that it indicates in a very delicate way that the solution tension of iron is higher at certain points on the surface than it is at others. Or, in other words, that certain surface points are, be it ever so slightly, electro-positive to others. The very delicacy of the test shows that it must be carried out with precise care. If a sewing needle is taken and rubbed with the finger at one end and then placed in the reagent and left there, it will be noticed that where the fingers had come in contact with the steel, the slight trace of sodium chloride from the fingers will cause corrosion to commence and continue. Bresch in a short review of the new theory of corrosion has made use of a graphic method to show the action which takes place when a piece of iron is immersed in the ferroxyl reagent. This diagram, which is self-explanatory, is shown in the following figure. Diagrammatic explanation of action in ferroxyl indicator. The ferroxyl mounts are prepared as follows: A 1I per cent, solution of agar-agar is first made by dissolving a weighed quantity of powdered agar in the requisite amount of water. This solution is boiled for one hour, fresh water being added to replace that lost by evaporation. It is then filtered while hot and 2 c.c. of standard phenolphthalein indicator added to every 100 c.c. solution, after which it is brought to a perfectly neutral condition by titration with a tenth-normal solution of potassium hydroxide (KOH) or hydrochloric acid (HC1), as the case may be. Thee addition of 7 c.c. of a 1 per cent. solution of potassium ferricyanide to every 100 c.c. of solution is then made, and the ferroxyl reagent, while still hot, is ready to use. Enough of the reagent should be poured into a Petri dish to just cover the bottom, and the dish floated in cold water until the agar has jellied. A clean sample of iron is then placed on this bed of jelly and covered with the hot solution. After the final addition of agar the dish should not be moved until thoroughly cool. While the colors sometimes show up immediately, they usually require from twelve to twenty-four hours to attain 'their most perfect development. The mounts may be preserved for many months by keeping the surface of the agar covered with alcohol. 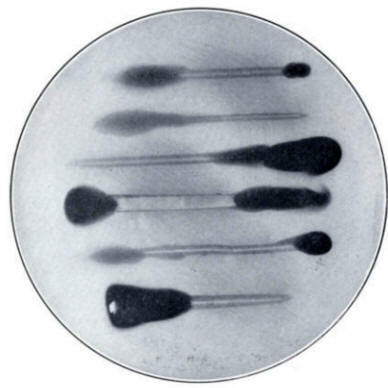 These effects which are produced in the ferroxyl indicator constitute a visible demonstration of electrolytic action taking place on the surface of iron and causing rapid corrosion at the positive nodes. The ferroxyl test in the hands of a number of investigators has brought out with clearness a considerable body of evidence to show that the electrolytic theory is in accord with observed facts when iron is undergoing corrosion. Some of the best results obtained are shown in the following pictures. Showing some results obtained in the ferroxyl test. Showing a number of iron and steel objects immersed in the ferroxyl jelly. Steel wire nails in ferroxyl jelly. Steel nails in ferroxyl jelly. It has been noted by a number of investigators that different samples of iron and steel do not rust in the same way when subjected to the action of water and air. While some samples show localized electrolytic action, as indicated by deep pitting, others become covered with a more or less homogeneous coating of hydroxide, which shows little or no tendency to localize in spots or nodes. The question naturally arises: In what respect do these two methods of rust formation differ? A close inspection of the following figure is suggestive if not conclusive of the answer in this respect. Strip of steel in ferroxyl reagent, showing frequent shifting of poles. 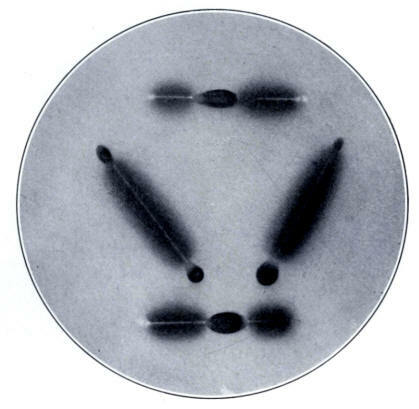 The photographic reproduction exhibits an effect which is frequently observed in the ferroxyl tests. When the colors first developed, two dark blue nodes formed at the opposite ends of the test piece, with a large pink area in the center, where for a time the metal remained quite bright. Very shortly, however, the poles changed, and the pink central area disappeared and gave way to a large blue node which enveloped three-quarters of the test piece, with a small opposed pinkish spot. Again and again a reversal and change of poles took place, and at least five such changes are clearly shown in the previous figure. As a result of this action the metal strip was rapidly covered over its entire surface with the same superficial, loosely adherent coating of hydroxide, which is obtained in many cases when certain samples of iron and steel are allowed to rust under a layer of water. It is presumable that as the surface of the metal is eaten into by the solution of the iron at the positive poles, a new condition of equilibrium occurs, resulting in changes and even reversals of the positive and negative nodes. This would indicate that in the case of metals which suffer from local action or pitting the segregation conditions are of a different nature from those which exist in the case of metals which rust more evenly. A rough analogy may be drawn by imagining an imperfect mixture of black and white sand, the respective grains of which may lie in streaks, spots, and layers, or may tend to arrange themselves in some more or less uniform relation to each other. 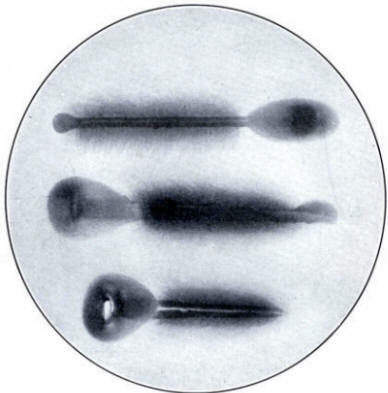 The best demonstration that the rusting and corrosion of iron and steel in all its forms is essentially an electrolytic phenomenon is afforded by the fact that it has not as yet been possible to find a specimen of such purity that no trace of positive and negative nodes will be formed in the ferroxyl indicator.